Who Really Sank Bismarck, the Pride of Hitler’s Fleet? Iain Ballantyne’s blog on submarines of the Cold War generated quite a deal of interest so I’m delighted to welcome Iain back again as a Guest Blogger, this time his topic is slaying the myths of the battleship Bismarck. Iain has released a paperback edition of ‘Killing the Bismarck’ which provides some fascinating updates to his earlier hardback and is justly recognised as the definitive account of the British part in the battle. The smoke over the water had not long dissipated, the fire snuffed out and thunder only just faded. The wrecked battleship Bismarck was now lying on the floor of the ocean, the majority of her crew killed aboard or drowned. The British battle-wagon HMS Rodney sailed away from the scene of combat in company with the Home Fleet flagship HMS King George V. It was Rodney’s massive 16-inch guns that did the close-up killing of Bismarck. If you believed this triumphant verse, it was all pre-ordained and those impudent Germans should have known better than challenge an island nation that had ruled the Seven Seas for centuries. In some ways Rodney’s sailor wasn’t wrong. The Germans had sent out their newest, most powerful battleship along with the heavy cruiser Prinz Eugen to destroy Allied convoys. While delivering a serious blow by sinking the battlecruiser HMS Hood on 24 May, the Germans soon discovered the Royal Navy could soak up disaster, spring back and bring its still considerable might to bear. The reality is that no warship is unsinkable, no navy can totally control the oceans, but the British had more experience and a bigger, better-balanced navy than Hitler had allowed his admirals to create. However, if you are to believe today’s majority perception of the Bismarck action the German battleship was unsinkable – in fact, she was so strong and invincible that it wasn’t the British guns and torpedoes that sank her, but her own scuttling charges. Debate has raged for years around this point, making it the focus of underwater investigations on Bismarck’s wreck. Some found ‘proof’ that scuttling sank her; while others have offered evidence she was already sinking due to the holes caused by British shells and torpedoes. The mighty 16-inch guns of HMS Rodney – the weapons that destroyed Bismarck. 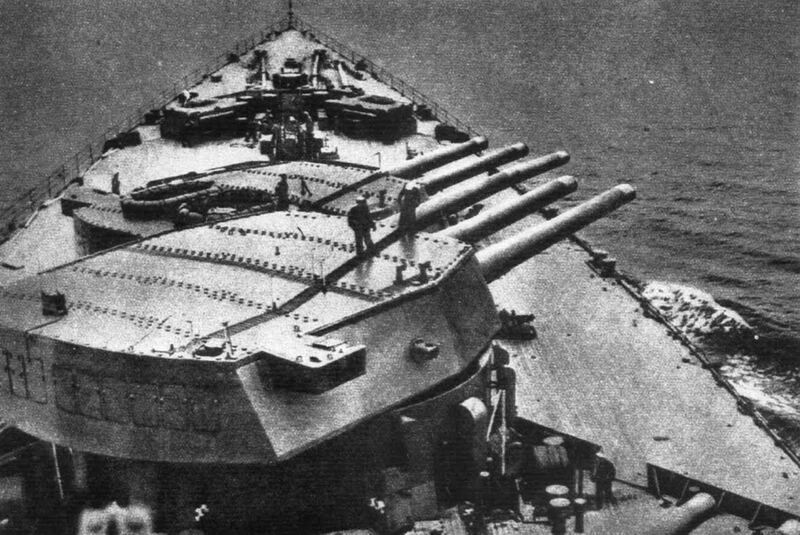 The narrative presented in many books on the Bismarck action makes too much of the German ship’s newness, of her 15-inch guns with their exceptional accuracy and of her awesome silhouette. The reality is that she was deeply flawed. Created in a hurry after Hitler came to power, Bismarck’s design was of First World War origin, with an armoured deck too low and a citadel that failed to protect the vital command, control and communications organs – and also people – that made her a formidable fighting unit. Her anti-aircraft gunnery record was lamentable, failing to shoot down a single Swordfish during two attacks by aircraft from Victorious and Ark Royal. Her steering was poorly designed and when she turned over and sank her badly welded stern fell off. But sea battles are not a game of top trumps, comparing calibres of guns and flaws in naval architecture. What matters is the human element and in that respect Bismarck was defeated before her final battle. Her men were utterly demoralized by being harassed across the ocean by the British. They had experienced a huge high after destroying Hood on 24 May but by 26 May were in a deep depression. They regarded the admiral in charge of their raiding mission as a Jonah and saw their chances of reaching a safe port as virtually zero. After the Swordfish attack that destroyed their vessel’s steering, many in Bismarck’s crew just gave up. And this brings us to the key element of controversy that my book ‘Killing the Bismarck’ presents, namely the contention that some of her crew tried to surrender at the height of the battle. When the hardback edition was published, and the surrender angle received national newspaper coverage, this caused outrage – from the USA and UK to Poland – among the ranks of those who still believe in the ‘invincible Bismarck’ myth. One thing I have learned over the past decade or more that I have been writing naval history books is that the accepted view of how events happened often collapses, or at least can sometimes prove open to question, when you go deep into the archives. With regard to the Bismarck action I looked at the ‘surrender’ claims via three different accounts. I found one (by a Rodney officer) in the archives of the HMS Rodney Association. In another, the son of the man involved (a rating in Rodney) volunteered transcripts and sound recordings. The third, from a sailor in the cruiser HMS Dorsetshire, was in the archives of the Imperial War Museum. The signs that these men saw included a man sending a signal via semaphore, mysterious light signals and a flag raised that seemed to indicate a desire to ‘parley’. I don’t see why these men would lie. I believe they saw some of Bismarck’s men trying desperately to surrender under a devastating weight of fire from two British battleships and two heavy cruisers. In the fore part of Bismarck, the British shell hits soon slaughtered hundreds of men and potentially killed the entire command team. The British sailors I quote were in a very good position to see what was happening. They were in action stations with an excellent view of the enemy and certainly in Rodney’s case they had high-powered optics and could see with shocking clarity what was happening. I don’t think people realize just how close Rodney was in the final moments. The men who were best able to see what was happening in the fore part of Bismarck were sailors in British warships, not German survivors. The latter mainly came from well-protected engineering spaces deep within the citadel or served in the equally robust main armament turrets aft. Was it possible for the British to take Bismarck’s surrender? No. Some sailors may have been trying to surrender in the fore part of the ship, but their shipmates elsewhere continued to fire on the British. Was it an attempt to surrender on authorization of Bismarck’s commanders, or just an initiative by some sailors who understandably wanted the killing to stop? Nobody will ever know for sure. No battleship deep in the heat of action has taken the surrender of another, at least not since the end of the wooden walls. Rodney and King George V were two very important capital ships. The British didn’t have many and the Royal Navy was in May 1941 taking a hammering in the Mediterranean during the Battle of Crete. Bismarck’s sister battleship, Tirpitz, was expected to set sail at any moment while there were other German high seas raiders lurking in Brest, waiting to come out and savage Allied shipping. To risk King George V and Rodney would have been a gigantic strategic error. Bismarck’s ensign continued to fly, she was still firing and for the sake of Britain’s security she had to be destroyed as a fighting entity. After the guns ceased firing on both sides – and it’s worth pointing out the Bismarck’s guns did not fall silent until the British put them out of action – it was a different matter. The brotherhood of the sea saw the hand of mercy extended. The most controversial element of the fresh material in this edition of ‘Killing the Bismarck’ is an account by an aviator who took part in the May 26, 1941 attack on the German battleship that fatally damaged her steering. Terry Goddard was a young Observer in a Swordfish of 818 Naval Air Squadron. Until he got in touch with me I thought John Moffat was the only living veteran of that crucial episode. 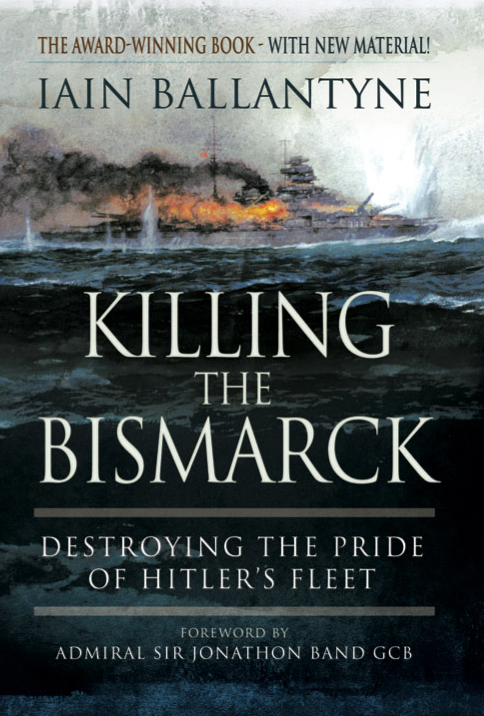 Terry, who is now 94-years-old, read the hardback edition of ‘Killing the Bismarck’ and emailed me offering an account he had written of his part in that mission, which I present as the headline element of new material in the paperback. It does contradict some recent claims about whose Swordfish torpedo did the fatal damage to the German battleship. History is organic, and ever evolving, with fresh perspectives to be discovered even now more than 70 years on from the Bismarck action. I was also pleased to be able to present material from another surviving veteran, who back in May 1941 made a transatlantic passage in Rodney as a 17-year-old midshipman. There is also a blow-by-blow account freshly rediscovered by the son of a Royal Marine officer who served in the gunnery director position of the cruiser Norfolk. ‘Killing the Bismarck’ is published by Pen & Sword. I have three copies of the paperback to give away. To go into the hat, email julian@julianstockwin.com with the name of the naval current affairs magazine of which Iain is currently editor. Please include your full postal address. Deadline: June 3. Winners will be notified by email. 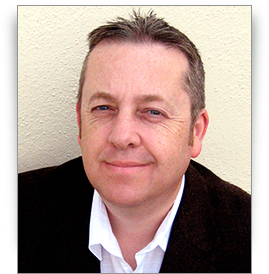 Iain is the author of seven naval history books. His most recent hardback is ‘Hunter Killers’, Orion Books. My father served on the Rodney for five years during WW11, including the sinking of the Bismarck. He always maintained that it was the Rodney that sank the Bismark. And because KG5 was the flagship it stood back from the main assault. He also maintained that because the son of the captain of the Rodney went down with HMS Hood that he got his revenge by pounding and pounding the Bismarck. Apparently, he recalls that the padre of the Rodney pleaded with the captain to cease the bombardment as he maintained that it wasn’t war, but murder. I’m afraid at least parts of the story you were told are wrong and a classic instance of the fog of memory leading to details becoming confused with the passing years. Rodney’s captain Frederick Dalrymple-Hamilton had a son who was a gun director aboard King George V but he did not have a son aboard Hood, let alone one who had been killed in the engagement with Bismarck. This fact is verifiable beyond doubt: the full list of Hood’s unfortunate crew is available online and contains no Dalrymple-Hamiltons. As the author of ‘Killing the Bismarck’ and the earlier book ‘HMS Rodney’ let me help untangle this a little, as you are both right in various respects. It is true that Rodney, with her 16-inch guns did cause the most damage (if you are talking battleships) in the final battle – her hits were decisive – but a lot of her shells (as she only had AP) went straight through. KGV stood off to allow Rodney the freedom of manoeuvre – not exercised on May 24 in the Denmark Strait by the British – to cause maximum damage to the crippled Bismarck. Some of KGV’s 14-inch shells were seen to bounce off, but others did cause damage – BTW the cruisers Norfolk and Dorsetshire used their guns to cause a huge amount of damage to Bismarck exposed areas, including command and control links. Again, this was different to May 24, when the cruisers watched the action but were not called in. Capt Dalrymple-Hamilton’s son was indeed in KGV (as explained in ‘Killing the Bismarck’ with quotes from him too). There was a feeling that KGV stood back in the crew of Rodney – but that was down to the normal rivalry etc. They also felt afterwards that their ship’s role was not given the prominence it deserved, again touched on in the books. 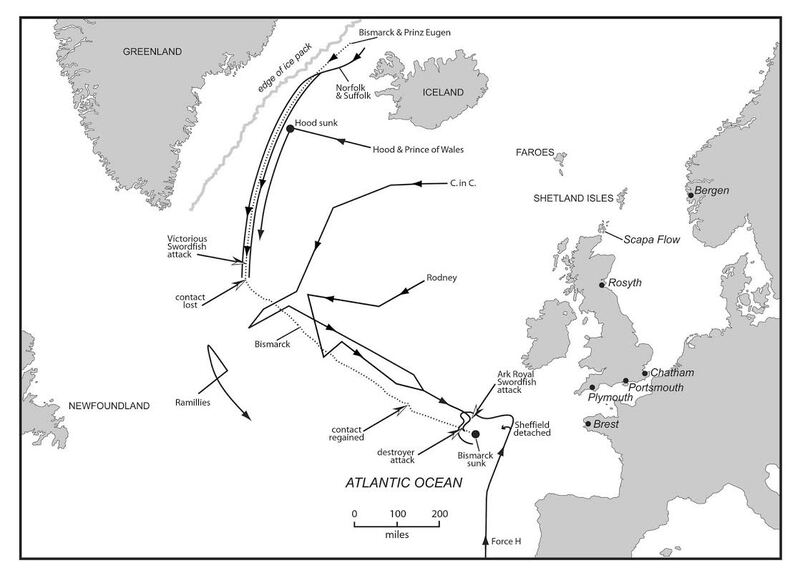 Vian’s destroyers also ‘stood back’ and the Swordfish from Ark Royal were warned off from making an attack on morning of May 27, much to their chagrin (also see my 2016 book ‘Bismarck: 24 Hours to Doom’ for more on that from aviators’ POV). One of the chaplains of Rodney did plead with the CO to stop the bombardment and was ordered off the bridge – but, as my books explain, it was a terrible job that had to be done and completed, as the fate of the nation was at stake. Nobody took pleasure in it. It was not a war crime even though some there later described it as ‘like murder’ (see ‘Bismarck: 24 Hours to Doom’) – some parts of Bismarck fought on even when she was reduced to a floating charnel house. Her colours were not struck and it was impossible to take a surrender in those circumstances, or to know if anyone was trying to do so. Again, discussed in greater detail in the three books. After destruction of a Nazi weapon of war that a few days early killed 1,415 boys and men in Hood – and threatened more havoc if she got away – the ships of the Royal Navy did their best in the circumstances to provide mercy and salvation to their fellow mariners. It was the feared arrival of the Luftwaffe, the known presence of U-boats (four were in the vicinity) and the lack of fuel that meant they had to leave before picking more people up. Sorry if this repeats some of the blog, but I hope it clarifies things afresh! i have been reading with interest and wish to say i have a hand written account of the sinking of the bismark, my father served on hms dorsetshire as a signal man and was there to witness that day ! i have yet to read in full the story of what happened as my dad has now passed and i must find the strength to read his memoirs . Hallo Jane, my father was also on the dorsetshie at the time of the sinking of the bismark, he also was in the Signal room as a PO? (not sure) he told me as a kid that he sent the Signal back to the naval HQ.that they have sunk the Bismark! your comments are the closest i have been to someone ( your father) who may have know him personally? I have been trying for ages to get a Crew list of the dorsetshie at that time NO luck!! my father has also past away, perhaps you have more info.than I have? Excellent article. Had a friend whose father servee on Hood, before she engaged Bismark, and was then transferred to Prince of Wales. This is essentially how he described the action. How he came by the knowledge I do not know. But it is certain, that Bismark did not strike her colours. My father was in Movement Control in the Royal Engineers during WW II, and got to know many officers and men in the RN. He also relayed a similar story. My Grandfather served upon the Rodney in WW2. He left the Navy after the war, even though he was offered a commission. He vowed never to leave England’s shores again. About 40 years later, during his retirement,he took the family to Spain. In all that 40 years he never said too much about the horrors of WW2, even when pressed by eager grandchildren! Perhaps, therefore, we shall never know. My Father James Reginald Kehoe served 5 years on the Rodney and was there on that day in B turret, the Bismarck after that action , my Father said, resembled an Aircraft carrier. Just heard a story from the son of one of the sailors on the Rodney, about the Bismark. The Bismark had struck its colours, a sign of surrender. But on churchills direct order the bismark was to be sunk. In retaliation for the Hood. Sorry for late response – I have been busy on another book. I can assure you that isn’t true. I have spent years looking into it (including talking to and exchanging e-mails and letters with dozens of Rodney sailors) and have produced two brutally honest accounts of it. She had not struck her colours and some of her guns were still firing even if some sailors attempted to surrender – an impossible act to pull off in such circumstances. I already made one comment but here are MY thoughts. The ship was battered and bruised from the British shelling. Her guns were all out of commission yet no sign of surrender. Her crew set off scuttling charges to prevent capture, although there was no thought of that from the British. The British will always believe they sank her and rightly so, but both British & German Sailors sank the Bismarck. In essence you are correct. There is a discussion of that in one of the appendices. The British filled her full of holes so that she would have eventually sunk and underwater explorer David Mearns describes Bismarck as a heavyweight boxer who is going down but has not yet hit the canvas. The Germans, who probably set scuttling charges, hastened the end. Thanks for your observations by the way. Excellent article, much enjoyed. Father served on the Rodney and previously on the Hood and Warspite. I myself followed earlier generations into the RN in the 50’s. Many thanks again for excellent article. The ship I live on served on the Kiel Canal from 1895 to 1947 she was the lead tug that towed the Bismark on her final voyage through the canal. Possibly why she still has a Kriegsmarine compass though she was never commandeered by them.